October 3, 2017 - New Yorker Electronics has released the new Exxelia Temex NHB Series of RF & Microwave Capacitors. The NHB Series is a complete range of MLCC based on NPO dielectric material. This material provides a very high Self-Resonant Frequency and limits the parasite Parallel Resonant Frequencies. NHB offers excellent performance for RF power applications at high temperature up to 175°C and at 500 VDC. The lowest ESR is obtained by combining highly conductive metal electrodes and proprietary of new NPO low loss rugged dielectrics. NHB series particularly fits for high power and high frequency applications such as: cellular base station equipment, broadband wireless service, point-to-point/multipoint radios and broadcasting equipment. Typical circuit applications include impedance matching, bypass, feedback, tuning, coupling and DC blocking. The series is available in 1111 size with capacitance ranging from 0.3pF to 100pF. All capacitors are packaged either as bulk chips or with tape or reel. 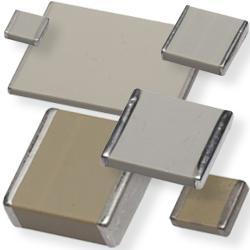 All components are RoHS compliant and available with magnetic and non-magnetic terminations. They also provide as a good alternative for MIL-PRF-55681 / CDR capacitors. European Military, space grades and custom made capacitors are also available on request. New Yorker Electronics is franchise distributor of Exxelia Temex, a member of the Exxelia Group, and supplies its full line of Film, Mica, Tantalum, Aluminum Electrolytics and Ceramic Capacitors as well as its EMI/RFI Filters, Magnetics, Position Sensors, Slip Rings and Rotary Joints.